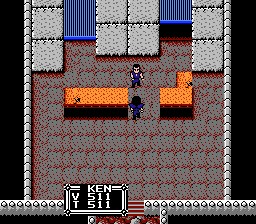 I have been playing this famicom game, Hokuto no Ken 3, and I find annoying that you need to walk AAAAAALL the way around the corner to do any shopping so I thought I would make an opening in the counter to make it more straightforward. 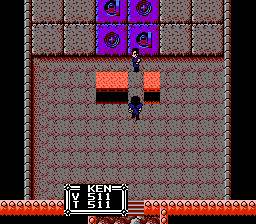 Now I just need to change the palette of that particular tile in order to match the main floor. The palette information is stored in VRAM, and with a bit of experience it's usually a cinch to change, you just need to find where the instruction is located in the game code. I'll do it later, but it requires me being at that point of the game and using the debugger. Can you provide an IPS file of what you've done, and an fceux save state if it's in a difficult location? If you only changed a few bytes then you can just write the changes you made and I can make them myself. That changes the tiles right in front of both merchants ro regular floor but it doesn't change the palette. All the shops in this game share the same layout and the changes apply to all of them. All I had to do was find which part of VRAM held the palette for the tiles in question (between $27C0 and $27FF), breakpoint to when it's written to - which found me a temporary bit of work RAM. Breakpoint on that RAM, et voila, the part of the ROM that it came from opened itself up to me. Then I just had to change the number to the right one. Thanks, now I see what you did. Is there any particular pattern you have to look for when searching the palette or just brute force your way through ppu memory? In this particular case, the game is so "well done" that just looking for the hex code in the rom got me to where it stored the palette without needing to reverse engineering any more XP. Now I'll try to widen the stairs leading to this place. Thanks a lot for the tutorial Psyklax!